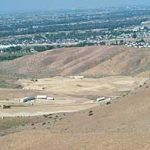 Hidden Hollow Landfill began accepting waste in 1972. Over the course of the next 40 years, this landfill would accept 12,400,000 cubic yards of waste weighing approximately 7,770,000 tons from Ada County. In 2013 Hidden Hollow received the last load of trash. In 2014 the Ada County Solid Waste Department will begin the process of permanently closing the Hidden Hollow Cell. The North Ravine Cell was commissioned by the Board of Ada County Commissioners in 2004 when the Hidden Hollow Cell was reaching capacity. The site for the new landfill is located directly north of the old, dubbing the new landfill the North Ravine Cell. The North Ravine Cell will be constructed in different stages. Stage 1 was completed in 2007, with Stage 2 completed in 2010. The North Ravine Cell provides the latest in safe landfill technology. When the North Ravine Cell began construction a thick liner was placed in the bottom of the cell. The liner provides a barrier to keep groundwater and soil from being polluted by the waste that is disposed of in the cell. 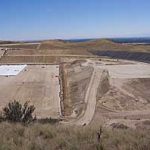 Additionally, the liner at the bottom of the cell is sloped; allowing extra moisture that is produced by the landfill can be drained out into the leachate ponds, located on site. While this cell is being filled the gas extraction system is being installed. The pipes and wells being installed will extract landfill gas when the North Ravine Cell is producing enough gas to be extracted. The North Ravine Cell, when completed, has the potential to service the residents of Ada County for the next 100 years.